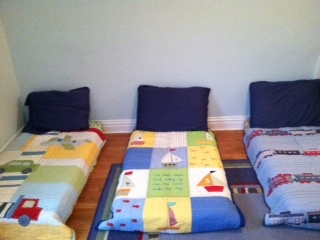 “Big Boy Beds” aka crib mattresses on floor! They made the big move last weekend and I have to say, it was a long time coming. Not in the literal sense — it’s not like I spent months prepping them for the big move, reading books about the transition or frankly, designing the ideal sleep space or investing in the perfect bedroom set (as the picture will clearly attest!). When I say it was “a long time coming”, I mean that our little fellas have been climbing out of their beds for a long time. They have been asking for beds. They told us they were ready and finally, we listened. Don’t get me wrong. 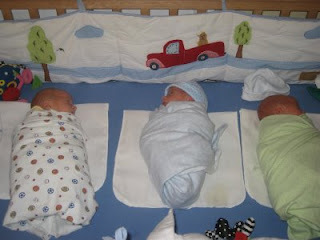 They weren’t unhappy in their cribs. Quite to the contrary, they loved them. They had all their stuffed animal “friends” in there — many of whom they played catch with from crib to crib. They would climb out in the morning, enjoying the independence and freedom to get their own Cheerios but, much to our surprise (and delight! ), they never climbed out at night. When they were in, they were in for the night. And we all had sweet dreams. Don’t stress out about it. If you do, they will. And if you don’t, well, did the fellas in the video look stressed out? Anticipate – and embrace – a change in your bedtime routine. Just as you did that night long long ago when your wee one first came home from the hospital and looked oh so small in that great big crib.